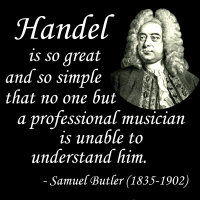 Victorian writer Samuel Butler’s wry and ironic observation captures the timeless profundity cloaked in easily-understood simplicity of the works of composing master Georg Frederic Handel. Now you can own this delightful quote (or give it away to your favorite Baroque music lover) on many marvelous apparel and merchandise options, as seen below! Buy it now on a t-shirt, hoodie, mug, tote bag or other quality gift or apparel items. Choose something for your favorite musician, music teacher or student, exclusively from GearGems! Lovers of Handel should also not miss this great portrait design as well!